You can always access the latest issue at chelseawestminsterhospital.newsweaver.co.uk so you might find it useful to add this link to your favourites. Would regular educational sessions held at the Chelsea and Westminster be of interest to you? Would regular educational sessions held at the Chelsea and Westminster be of interest to you? If educational sessions are of interest to you, what time would suit you best? If educational sessions are of interest to you, what time would suit you best? If educational sessions are of interest to you, what topics would you like to see covered? The hospital will be having its annual Open Day on Saturday 7 May from 11am to 3pm. More than 1,500 people attended last year’s Open Day and we hope that it will prove just as popular this year. The theme of this year’s Open Day is ‘Your hospital, your health, your say’ which reflects the fact that Chelsea and Westminster belongs to all who use its services, work here or live locally. Our Open Day aims to educate, inform and entertain visitors with events including behind the scenes tours, health advice, healthy eating tips and live music. This year we will also be celebrating the official opening of our new airport-style outpatient department area – which includes self check-in – on the Lower Ground Floor. We have invited many of our partner organisations in health and social care, including our local primary care trusts and local boroughs, to take part in the Open Day and we are placing a strong emphasis on promoting public health at the event. The diagnosis of patients with emergency presentations of new cancer. Complications due to a known cancer diagnosis. Complications of cancer treatment such as chemotherapy or radiotherapy. We provide a daily, rapid access, consultant-led clinic for the investigation and diagnosis of patients with an acute presentation of suspected malignancy. Patients can be seen within one day of referral. By fax on 020 3315 8863. Please note that this service is not designed to replace the established ‘2 week wait’ referral pathways which should be used for patients with an identifiable primary cancer site. The AOS also provides an inpatient service whereby any patient with a known or suspected diagnosis of cancer admitted to Chelsea and Westminster Hospital is reviewed by a consultant oncologist within 24 hours of arrival. Deputy Prime Minister Nick Clegg visited Chelsea and Westminster Hospital on Wednesday 27 April for the first listening event on NHS modernisation exclusively for patients. 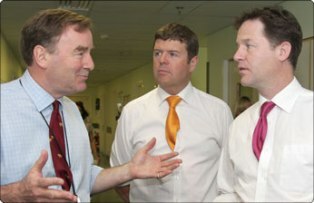 Seen here with Dr Michael Pelly (Left) and Care Services Minister Paul Burstow (centre). He also met patients and staff during a tour of the hospital including the Stroke Unit and the new Outpatients Department. Following the tour, Mr Clegg and Care Services Minister Paul Burstow met more than 30 patients from the local area including Foundation Trust Governors to hear their views and discuss modernisation plans. They were joined by Professor Steve Field who is Chair of the NHS Future Forum which will drive engagement in the ongoing listening exercise. As part of our exciting programme to refurbish and expand our paediatric unit at Chelsea and Westminster, and to create a brand new dedicated 4 paediatric theatre suite, we are temporarily re-locating our paediatric dental operating lists to the West Middlesex Hospital in Isleworth, Middlesex. This will help us maintain our very busy children's dental service over the summer and builds on our successful partnership with the West Middlesex Hospital, where we already undertake general paediatric surgical lists. Many of our dental patients are from the west of London so we hope this change will be an opportunity to offer a service closer to home for many children as well. The dental operating lists at the West Middlesex Hospital will run under the same standards and use the same staff as at Chelsea and Westminster and outpatient and follow up care will still be provided at Chelsea and Westminster. Patients will be given full information about their operation at West Middlesex Hospital at clinic and pre-assessment. Should you have any queries about this temporary move please do contact the Paediatric Dental department at Chelsea and Westminster on 020 3315 5232. We will also be writing to all referring dentists with relevant details. The North West London Commissioning Partnership have launched their new IVF Policy. The Assisted Conception Unit (ACU) has been named in the policy as one of the providers of choice and is happy to welcome referrals from all of the North West London area. Based in the Westminster Wing of the Hospital, our recently refurbished modern facility offers rapid access to a full range of fertility services for NHS and self-funded patients. ACU provides a wide range of infertility investigations and treatment with a special interest and expertise in the management of fertility problems in older women. We are the only national referral centre for the management of couples with HIV or Hepatitis who seek fertility treatment and a centre of excellence in the management of male factor infertility. Soon, we hope to be able to broaden access to our expertise through community fertility clinics. The guidelines for access to the Neonatal Jaundice Clinic have been updated and take effect as of Tuesday 3rd May 2011. *This age is at the time of Clinic Appointment, not age at referral. Please download the full guidelines here or contact Leigh Marsh our Community Paediatric Coordinator for further infomation. Chelsea and Westminster Hospital NHS Foundation Trust has been shortlisted for this year's CHKS patient safety award—part of the CHKS Top Hospitals programme 2011. The programme, which is now in its eleventh year, celebrates excellence in the areas of patient safety, quality of care and data quality. The CHKS patient safety award is made on the basis of publicly available datasets and every NHS acute trust is included in the analysis. Five other organisations have been shortlisted for award with the winner being announced at the awards ceremony to be held in London on 10 May. By now I hope you will have received hand delivered copies of the 2011 Chelsea and Westminster Hospital Directory of Services. Given the choice and complexity of services offered by hospitals in London we have aimed to provide concise, easy-to-access information about the services we offer and the healthcare professionals that provide them. I hope the directory proves to be a useful tool to you when accessing our services. This year we will also be adding a consultant directory to our website with information on the specialist interests and contact details of each of our consultants. The directory is also available on the newly updated Healthcare Professionals section of our website. Do you have any comments or feedback on the directory or our website? Is there further information you would like to see on our website? Would you like more copies of the directory? If so please contact Jonathan Harris. Hospital Arts, the arts-in-health programme at Chelsea and Westminster Hospital, has launched an innovative new singing project for pregnant women within the Maternity department and local community clinics. Singing can provide emotional, social, educational and physical benefits for women and their babies during pregnancy, labour and after birth, and the workshops are a fun way for them to get to know one another. The workshops involve postural, breathing and vocal exercises, as well as singing songs that are easily learnable. Workshops are open to everyone receiving care within the maternity department in the Hospital and community clinics, so please encourage those to attend who you feel would benefit. The workshops run every Monday evening at 6.30pm in The Tent, second floor, Chelsea and Westminster Hospital. Following the inclusion of our antenatal services on Choose and Book in March we would like to remind you of the process for making referrals to the Hospital using Choose and Book. Our team will then call the patient and arrange their appointment. The service is listed as a “Telephone Assessment Service” on Choose and Book but please note that the appointment time given is not a real appointment and the patient will be contacted by phone to book their appointment within a week of the referral. Given that the appointment is a dummy appointment, there is no need to give the appointment letter to the patient. Please just ensure that you have provided us with all of the patient’s current contact details so that we can call them. Access to this clinic is available via Choose and Book. Multiple visits to hospital are avoided and patients receive their diagnosis and where required, treatment in a timely, efficient manner. The West London Centre for Sexual Health recently launched a new sexual health service - The GOLD Clinic - in collaboration with The Gender Identity Clinic in Hammersmith/ Charing Cross GIC . This provides a dedicated sexual health screening service to the transgender community onsite in the Gender Identity clinic. To book an appointment or arrange a fast track referral to West London Centre for Sexual Health phone our Health Advisers on 020 8846 1579 and ask for The Gold Service. Also see the Sexual Health section of our website for further information on all of our sexual health services. From the 1st April the MSK Physiotherapy Service began sending discharge letters to practices electronically for patients who have completed a course of physiotherapy treatment. The discharge letter provides information for GPs on the treatment outcomes for patients who were referred to physiotherapy either directly by their GP, by a Chelsea and Westminster Hospital consultant or via the MSK Triage Service. We hope this development will increase the timeliness of physiotherapy communication with practices. If you are expecting a discharge letter from the MSK Physiotherapy Service but have not received it electronically please contact Jonathan Harris. If you would like further information on our MSK Physiotherapy Service please contact Edel McKeever or visit our website. The Gynaecology team will be hosting a Womens Health Study day, open to all primary care professionals on the 29th June. Topics presented on the day will include, urogynacology, psychosexual medicine, fertilty and female genital mutilation. There will also be the an opportunity to discuss case presentations with an expert panel. The number of visitors to our website has almost doubled in the last two years—in 2010 almost 500,000 visitors logged on. We hope the website and these new videos will provide a useful resource should your patients have questions on the Hospital and their potential visit.